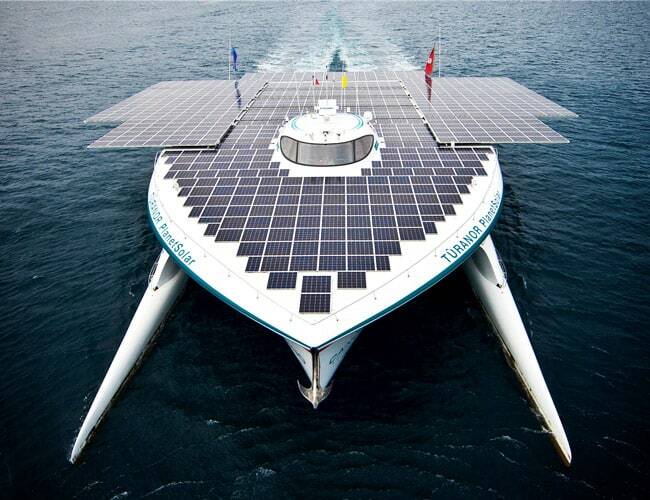 The world’s biggest solar powered boat, the MS Tûranor PlanetSolar, has been donated to the Swiss-based Race for Water Foundation. The €15 million boat was financed by a German entrepreneur, built by Knierim Yachtbau and holds two records: the fastest crossing of the Atlantic Ocean by solar boat and the longest distance ever covered by a solar electric vehicle. Tthe name Tûranor is an Elvish term created by J.R.R. Tolkien meaning “power from the sun.” Developed in 2010, the Swiss company PlanetSolar created the ship, which can travel around 5 knots. In May 2012, it became the first solar electric vehicle ever to circumnavigate the globe. Expedition leader and founder of the PlanetSolar project was Swiss eco-adventurer Raphaël Domjan. The photovoltaic cells have a yield of 22.6 percent and almost cover the whole deck. Unlike the majority of solar panels, they can support the weight of a human: up to 80kg per square meter. As discussed, BusinessInsider is reporting that the boat has been donated to the Race for Water Foundation, who will use it as a mobile laboratory for scientific missions to raise awareness about renewable energy. If you want to read more, the story of Tûranor PlanetSolar can be found in Kevin Desmond’s 280-page Electric Boats and Ships: a History published by McFarland Books. If this was built in 2018, you wonder how much more effective it could be. We’ll no doubt see its successor at some point – it’ll be amazing to see how much more powerful our solar panel technology is!